A new look for company pages on LinkedIn? 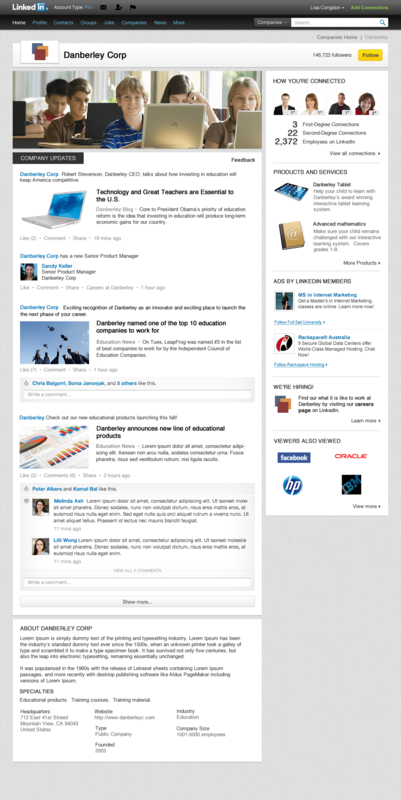 LinkedIn is showing off their latest effort toward providing a better user experience for their clients. The new look for the ‘Company Pages’ section was recently introduced on LinkedIn’s blog – Introducing a New Look for Company Pages. Besides the much cleaner and organized look and feel of the revamped design, LinkedIn’s update also gives companies greater marketing opportunities. The new page, following the “a picture is worth a thousand words” philosophy, allows companies to add a main image right under the company name on the landing page and above everything else! I hope that this gets companies to put more effort into their LinkedIn pages. It is important to take advantage of the unique opportunities to market and share the LinkedIn platform represents and the company image should fully represent the business, not just knock-off the current Facebook Fan Page cover image.